hi, can you post a price and a list of this kit?..also .where can we get in touch with your company? Just send him a PM. Ed's a good guy he'll take care of you. mooch1, you may have to wait A WHILE. I messaged him back in December and am still waiting for a response. Now, I don't NEED brakes right now, but would like to get everything situated ahead of time, so when the day comes I can get everything right away. hey guys thanks. i just would like to know the price and availability of these conversion parts...i have drums now and they work ok...but this conversion kit seems easy to install ..do you know what kind of discs and calipers needed?..and from what vehicle they come from?.. i would like to have this kit for the fall and install this during the winter nice and easy in my garage on my spare time,,,i'll wait and see if he responds...no rush......thanks again././. First, I just wanna say Ed correct me if I'm wrong on any of this. This is for the 89?-92 J65 rear disc setup. 11.65" rotors, single piston calipers. They were also available on 93-97 4thgen cars, although slightly different calipers and e-brake setup IIRC. You can find cheap white box rotors, but the calipers are pretty expensive (unless you find some in a junkyard). You'll probably also need a proportioning valve (stock or Wilwood adjustable) since you have drum rear. lot or your questions can be asnwered on his webpage. ^^Hell yeah, thanks. Is that Ed's site? Yup. Dang good deals. Im running his caliper brakets on my 10bolt no probs so far, doubt i will either. They look good. May be for sale soon looking for a 4th gen rear. I may sell my brackets with pads, rotors, calipers, cables. are you still selling these conversion kits? PM sent with my info..thanks! I'm a bit busy, yes, to say the least. I caught up with all current PMs yesterday, e-mail is another story.. Best bet is to call if you want to discuss application and specific questions. FYI, the LS1 conversion cables should be coming in a week or so. I finally got to work on my own car and moved it in order to fix a few things and do a rearend swap/LS1 disc upgrade. Pics and info to follow in another thread. Yes, '89-97 calipers will work with them. The calipers are essentially the same during these years. I made brackets to use the stock 11.6" size, larger 12" rotors, and full 13" rotors should you want to go that large. I'd install either a disc prop or an adj. valve, yes. Hey Ed, out of curiosity is that an off-the-shelf 12" rotor ? Hey Ed, one more question, I have the stock Z28 rims will the PBRs fit? What about with the 12" rotor? I have a 91 TA, unfortunatly in came with rear drum brakes. I have purchased a complete set of disc brakes from a 92 Z28 (calipers, 11.6" disc, all the hard lines and parking lines). From reading your thread it appears I am only missing the adapter bracket. Are you still selling them? how much? Might i ad the parts i have bought off of ed very high queality. With that said i just bought a 4th gen rear with the discs so mine will be for sale with calipers and pads and rotors. Actuall the whole rear end but i guess i can stick that in the for sale ads haha. Thanks ED. willl be looking at big brakes for the LT1 rear soon. Yes, these brackets are all you'd need. Please note that since you got 3rd gen rear discs you'll have to either turn your drum axles down a bit or just get new rotors from a 4th gen so you won't have to turn the rotors. Drum axles (3rd gen) are larger in OD than disc ones. Love em. Sad to sell them. Id like to hold them for future project. But Ill be hitting you up for big brakes soon. got to get the LT1 in first (dash, motor, trans and rear from 95). DO you know anyone that is interested in these before i slap them on the for sale? Last edited by Chrome on Rust; 08-16-2009 at 07:13 PM. So let me make sure I understand this. Which style rotor might give you trouble with this swap due to axle flange size, The old looking one on the right?? or the new looking one on the left?? Could you please send cost and everything your kit comes with to [email protected]. I would like to do this conversion to my 1991 Z28 Convertible. 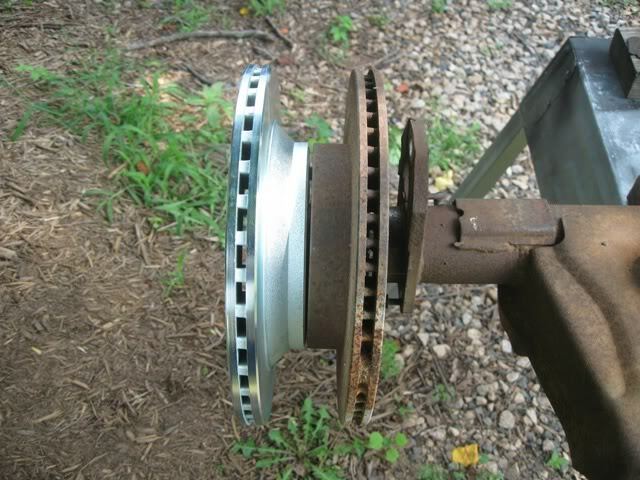 if you have a drum rear like i have ,,you need the 1995 type rear rotors ,,,this will allow you to install them on your axle flange with no hassle..it is the old disc in this pic..notice the center of the old disc...hope it helps.. Thanks for the reply. You are correct on my vert it has rear drums. But I am looking for the whole kit. The rear discs are easy enough but the rest of the mounting hardware is what I'm really looking for. I would like to know what the price of the kit is and what it consists of. hi , you need the calipers (try ebay) or get re-built ones & that's fine,,the pads and discs you can get anywhere as long as you get pads from 89-92 for pbr calipers, actually these pads also fit on rear 93-97 rear camaro and firebird calipers since they use pbr calipers as well....as for the discs , there are 2 types of 11.5 discs out there ,,ed says if you can't fit the rear 89-92 rear discs on you drum axle flange ,,then get 93-97 rear discs,,,they will fit on your drum axle flange without any problems....( i got new 1995 ones) then you can get the brackets from ed miller..these are from flynbuy performance,,i paid $85 for them and these will bolt to your drum axle flange with no hassles...very easy...i recommend you get new L/R caliper rubber hoses and also the rubber hose that is on the diff that splits to the left and right calipers (everybody forgets to change that one),,then depending on your budget , you should either get shaped steel brake lines ,,or just replace them with new ones from the rubber hose that splits to the calipers hoses left right...i also changed the prop valve and put one from a 1989 gta with 4 wheel discs,,,this is very important because the pressure for disc/drums and 4 wheel discs isn't the same ...then bleed everything and try it out...you should get also the e-brake cables so your e-brake is functional ...ed has all these parts and also the whole kits available if you don't want to buy items piece by piece...i took my time and bought some stuff here and there over the summer and then got the brackets ,,it depends on you and how much you wan't to spend on your car...you might have to use shims or spacers for the caliper brackets if they rub a little ,,after you bleed everything just try it out and see...most times it should be fine ,,,i hope this helps and good luck ,,let us know what happens. I'm stuck for now. Ordered the kit last night, Hopefully it wont take long to get here. I am looking foward to getting the Iroc back on the ground. New calipers and rotors ready to go. Sorry for the delay in responses, I'll be catching up on e-mail and PMs over the next week. Thanks Mr. Miller, Looking foward to getting this thing on the ground. I do have a question for this conversion? I see that no Dust sheilds are used, Has this ever been a problem for anyone? ( rain and dirt affecting braking ) Just Qurrious. I bought this kit as well as the front end c5 kit from Ed. I just got the stuff in the mail, got the front end done, but this rear is a bear. I got the axles out and everything, I am now just trying to get the fluid cylinder off as well as the monster bolt. I wish I had the rear end off the car. Anywho, I am having a buddy come over today and we will see what we got. Overall though, very easy upgrade. I would recommend buying from Ed anytime. Once I am done, I will post a new thread. No, the newer plates and even some of the '89-92 plates have them removed. You'll be fine. Hey Ed. When do you think I might expect the kit. I know with the holidays and all youv'e been busy, just anxious. Thanks ED, Good luck to all getting anything done this weekend!!!! BRRRRRRRRRRRRRRRRRRRRRRRRRRRRRRRRRRRRRRRRRRRRRRRRRRRR!!!! Ya, I now got the backing plates on and the rear end put back together. The only thing left is running the axel hard lines and the e brake cables. I stoped working on her now becuase I will have to splice in a new line becuase where the main line goes into the splitter wont come off and is twisting the whole line off. I would have done it but its been really cold here lately and I have no heater in the garage. Soon as it warms up I will go get a line and flare kit to fix her. I am just glad I am past the tough part. Great thread, I am doing the exact same thing you outlined. I am in need of the adapter brackets and the proportioning valve. Is Ed still selling these pieces? Left a few Emails at the site with nothing back. I would like to get a set of these brackets if still available. TIA. good luck. He PM'ed me saying he was going to call me 3 days ago because he had the day off. He never called me, or responded to a 3rd voicemail I left him 2 days ago. I've been trying to get ahold of him for 4-5 months now. He's STILL on da' lam?! Hope nothing bad has happened.